There is no doubt that leather is considered as one fine statement of style. Whether you are an average looking guy or good looking; when you slip into leather clothes it more or less makes you appear stylish and at the same time super hunk. 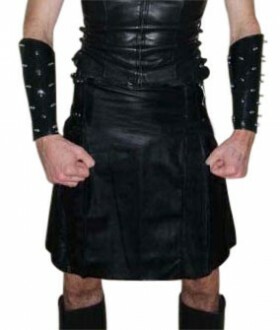 There are men who look for style in leather kilts. This is the reason why a lot of fashion designers have showcased a huge range of them which are not just comfortable to wear but fashionable also. Leather as we all know is a genuine material and is used on a large scale in making accessories and clothing. The material leather that is used in making leather kilts are long lasting and tough that you just cannot resist wearing it. These also come in many pleated styles and are available at affordable prices. Leather kilts have been designed with fine lines. These are fast becoming a constant and trendy fashion for the men and those who wish for something different this season can choose from an array of styles which is available to you. These now are fashioned with pockets and dissimilar from the traditional kilts that sit a bit high on the wearer, leather kilts are finely modified to sit on the hip area. A belt too can be added with this style of leather attire. One of the best finishes of leather kilts is a base without hem. This will ensure that the pleats on the skirt like kilt looks better with a simple cut edge on it. These are worn at many formal events like wedding ceremonies and other sporting occasions. Hollywood rapper and beau of socialite Kim Kardarshian Kanye West was recently spotted wearing leather kilt at one of his rock concerts. This was the rapper’s newest addition to his closet. The look was kept very subtle and he easily won the crowd by wearing this kind of fashion clothing. At the end of his performance he took a moment to speak to his fan followers and truly stood out in the crowd with his rocking performance. Kilts are nothing but knee length garments which is created by Scottish makers long back in the 16th century. During the ancient times, kilts were available in full length cuts which were worn as cloaks on the body. Nowadays these are commonly linked with Scottish culture and it has become a fashionable clothing item for men in the recent years too.